Our Contest Winner for the month of April is bringing us a serious dose of the Tropical Blues! This flavor is all about a delicious blend of bold fruit tastes along with a cool, icy blast of menthol to chill it out; hence the name! It’s tropical alright, and most definitely cool and tingly. If you’re up for a rather intense, super invigorating, wildly refreshing taste, this is the perfect flavor to enjoy it! The best part: while this amazing flavor is our Contest Winner, it will be specially priced at 25% off for the entire month! Nothing better than scoring great juices at great prices, and we are most definitely here to bring it to you! Enjoy the blues, the Tropical Blues, vape fam! Every month, we give you, our loyal customers, a chance to have your blends featured as a contest-winning blend. We offer plenty of juice flavors and the ability to create thousands of other blends as a result, and since you guys are in the thick of it, vaping and creating your own blends, why not highlight the incredible blends you create? It’s a pretty awesome thing when your customers create rad juices, so in that manner, we are all about sharing the love and great flavors! Have a blend you think we should know about? Make sure you submit it; it just may become a Contest Winner blend! April’s Contest Winner is pretty darn phenomenal; hence why it was chosen as the flavor you need to be vaping at the moment! This highly enjoyable delight combines sweet tropical fruit with the chill of menthol, offering a cool yet juicy rush of flavor; is your mouth watering yet? What makes this flavor so unique is the brilliant blend of fruit involved. It starts off with Island Pineapple, which sets the scene for tropical escapism. This flavor is further enriched with the addition of Blueberry Blast, which complements the citrusy pineapple perfectly, adding some berry freshness to the taste. The flavor is then made entirely unforgettable with Menthol Freeze, which delivers the most intense yet sensational addition! Fruit and menthol are an insanely good combination for vaping and if you have yet to try such a pairing, now is your chance! We like to keep it fresh and if there is one thing we are all about when it comes to our vape juices, it’s variety. 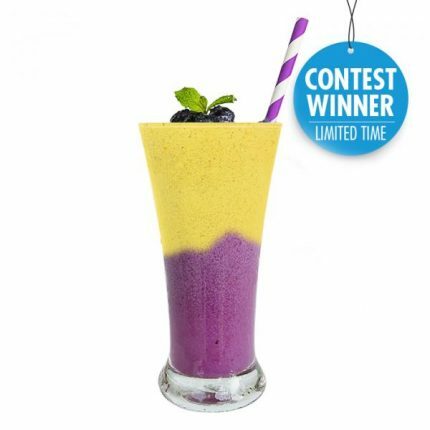 This month, our Contest Winner blend is a super sweet, chill taste we are sure will keep you feeling refreshed all month long. Tropical Blues will drive the winter blues away, replacing them with this deliciously cool taste that will have your taste buds feeling like they’re already on vacation. Grab it while it’s hot; this fine contest-winning blend is going to be priced at 25% off for the whole month of April; enjoy the delicious vapor and marvel at the creativity of our fellow vape fam!